The 2019 VC Bristol Open 10-mile time trial was held on Sunday on the U7B course starting at Falfield. The conditions presented a testing outward leg, with a welcome tailwind on the return. Thirty riders competed, five representing VCB. A big thank you goes out to the Timekeepers, Marshalls and other volunteers for making this event possible. 1st place: Jon Gates (Royal Air Force Cycling Club): 20min 35sec. The weather was once again good for our annual outing to Belmont Hill. Eight riders signed on for the start, six representing Velo Club Bristol. Winner on the day was Steve Thomas (BRC); second and leading VCB rider was Rob Sutton; third place went to Chris Truman (VCB). Last night saw the final event in what has been a very successful TT series. This was down to the support of VCB members, KiT members and others who organised and ran the event (plus only one roadworks incident). Special thanks goes to Mark Bishton for coordinating the events and ensuring sufficient volunteers were available. Twenty riders competed, three representing VCB. Top spot on the night went to Lee Aston (Sodbury Cycle Sport) with 27min 01sec, Chris Davis (Giant CC Halo Films) broke 28-minutes to finish second with a time of 27min 57sec and Gaz Poulson (RAF/MoD) came third with a time of 28min 52sec. The penultimate event in this year’s series saw a good turnout with 25 riders (seven representing VC Bristol) competing over the rolling 12mile course. The wind helped somewhat on the outward leg but made things hard for the return. Top spot went to Lee Aston (Sodbury Cycle Sport) with an impressive time of 26min 54sec. Lee Francis (VCB/KiT) was second with 27min 44sec and Chris Davis (Giant CC Halo Films) third with a time of 28min 03sec. Thanks once again to Kingswood Tri for hosting the event. See you all for the final outing of the year next week. The ninth evening time trial in the series was the annual “Versus” event between Velo Club and KiT. The prestige of the event and the good weather produced a large field (36 riders) and a strong VCB contingent (12 riders). Overall the versus event was won by Velo Club Bristol. The fastest individual time was recorded by Lee Francis (representing KiT in this event) at 27min 27sec, Phil Stonelake (BRC) was second in a time of 27min 54sec and Chris Davis (Gian CC Halo Films) was third in 28min 02sec. It was a fantastic event and a huge thank you goes out to all of the riders and volunteers who made this possible. Kingswood Tri hosted the eighth TT in the series . Fifteen riders competed, with three representing VC Bristol. Lee Francis (VCB/KiT) topped the table once again with a time of 27min 45sec, Alistair McHeoney was second with 28min 07sec and Darren Pitman(SCS) was third in 28min 21sec. Thanks to KiT for hosting and to all the marshals and helpers. 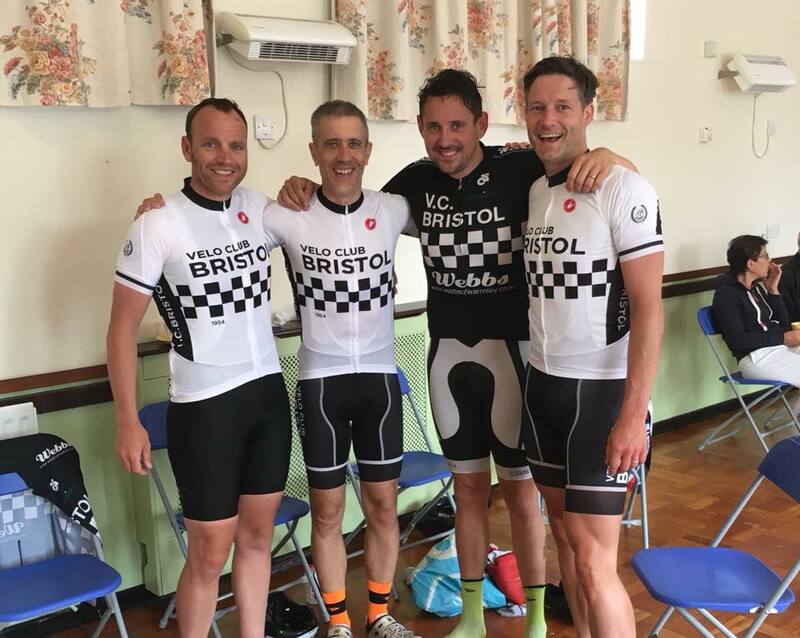 Five VC Bristol riders took on the U7B 10mile TT course at the Severn Road Club Open TT on 30th June. The seventh TT in the series kicked off a little early and there was no need for penalties to decide the result. Eleven riders competed, with three representing VC Bristol. Conditions were good, and times were fast. Lee Francis (VCB/KiT) was first with a time of 27min 41sec, Chris Davis (Giant CC Halo Films) was second with 27min 58sec and Wayne Osmond (VCB) got third in 28min 00sec. The sixth of the evening time trial series was held hosted by Kingswood Tri Club. Fourteen riders competed, with four representing VC Bristol. Conditions were good, if a little hot, and this led to some fast times. Lee Aston(SCS) took top spot with a time of 26min 50sec, Brett Halliwell second (27min 25sec) and Lee Francis (VCB/KiT) got third (27min 37sec). Many thanks to Kingswood Tri and the volunteers for hosting. Roadworks on the course meant event #5 in the series had to be cancelled. Check the Facebook page for up-to-date status reports on future events.